Saltmarshes, rivers, tidal flats, banks, bogs and swamps are all areas of interest that serve to protect Danvers. These important resource areas prevent flooding, filter pollution, and provide crucial habitat for wildlife. 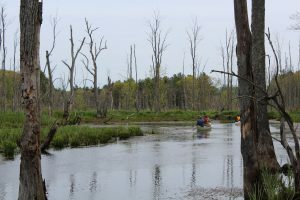 Through regulatory permitting of the Wetlands Protection Act, the Danvers Conservation Commission works with residents to assure that these areas are protected and preserved. Whether it be a new subdivision or a single family home addition, the Conservation Commission oversees all jurisdictional projects to make sure necessary precautions are taken. The Conservation Commission meets the 2nd and 4th Thursday of every month. Commission Members: Michael Splaine (Chair), Peter Wilson (Vice Chair), Vanessa Curran, Chelsea King, Richard Souza and Neal Waldman (Alternate).